Welcome to Motel 6 Houston – Brookhollow! 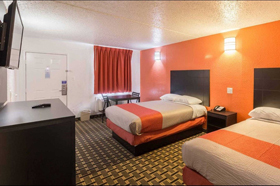 We’re the hotel in Houston Brookhollow Texas that both business and pleasure travelers can trust for an excellent overall experience and affordable comfort in a great location. We have everything you need in a budget hotel plus the trusted Motel 6 name, so what more could you want? We’re pleased to be situated off I-610 and near 5050 Acorn Golf, which is within easy walking distance. Astroworld is within a quick drive. Indoor-outdoor fun at Speedy’s Fast Track is also nearby – and there are restaurants and stores to explore close at hand as well. Plus, everything that Houston has to offer is within reach, including the Houston Zoo, Space Center Houston and much more. We offer free wifi in every guest room and feature coin laundry facilities. We also have all the amenities you expect from a Motel 6, including free coffee, free expanded cable and free local calls. And as always, we’re a pet-friendly hotel where kids stay free. We want to be your Houston Brookhollow hotel and look forward to the opportunity to serve you. Why not reserve a room with us now? You’ll be impressed with every aspect of your stay with us – and we look forward to meeting you. 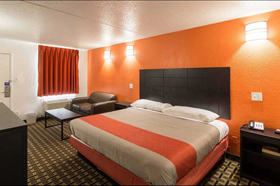 Business Travel :When looking for a hotel in Houston Brookhollow Texas for business travel, we’re here for you at this respected Motel 6. We’re also close to Astroworld and many other attractions if you have some free time. We’re here with free wifi and ample amenities sure to meet your needs while exceeding your expectations. In addition to being among the most affordable Houston hotels in the Brookhollow area, we’re also close to important local companies and organizations. 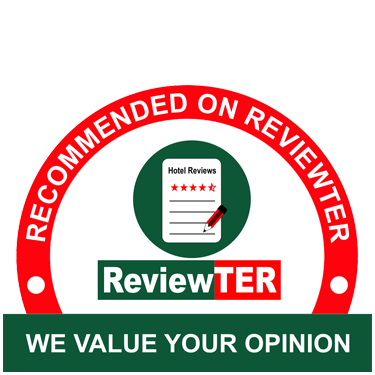 Why not stay with us so you can take it easy at our hotel while others are dealing the problems they may be finding from staying at a bad hotel? Here, you’re always at home. Vacation Travel :Let us be your home away from for vacation travel. Stay with us when traveling with the whole family or taking some friends for a nice getaway. When looking for hotels near Astroworld Houston TX or close to other other attractions and local points of interest in Houston, we’re here for you with a great experience at an affordable price. We’re also your best selection when you need a place to stay where comfort and value provide convenience to restaurants, shopping and more. Brookhollow Houston TX motels are simply more affordable when you choose us. So why not book a room with us now? You’ll be glad you made the right choice. 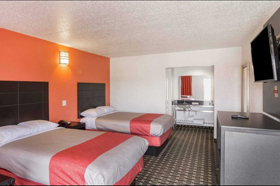 Affordable Hotel Stay : Hotels in Houston Brookhollow TX can vary significantly in price, but when you want a hotel that won’t break the bank, we’re here for you at this Motel 6. No other motels in the Houston, Texas area offer you the affordability that comes from staying at our well-managed property. May we meet your needs and offer unmatched customer service to you here? Our hotel comes at rates that will fit any budget. And we’ll have a room for you when you need us if you book early, so why not book now? You can join the long list of customers who find our property as appealing as it is affordable. Comfortable Stay :Looking for everyday great rates where your business will be appreciated and you can stay in absolute comfort? You won’t sacrifice and will sleep in comfort when you stay with us at this Motel 6. We’re pleased to offer free wifi, free parking and other great amenities along with comfortable beds, classic rooms and great service that make every moment at our selection of Houston Airport Hotels a pleasure. Why not book your room now to avoid any disappointment? Reserve now at this property because hotels in our area often book up quickly. We look forward to meeting you and meeting your needs, so why not stay with us when in the Houston area? Do you know about these things in Houston? The 5050 Acorn Golf course is waiting for you and the family – and everyone will enjoy the easygoing fun. Speedy’s Fast Track is also a place where everyone in the family can have fun, and it’s also close to our Brookhollow hotel. Astroworld is just one of many other attractions that are close at hand and fun to visit when the Houston area. Expand to see more of Houston and visit Houston Zoo, Space Center Houston and other attractions around the area. Take time to visit fine dining and local independent businesses in the area for unique Houston experiences you can’t get from chains. This website is owned and maintained by Motel 6 Houston - Brookhollow, a licensed user of certain proprietary trademarks and service marks of G6 Hospitality LLC.